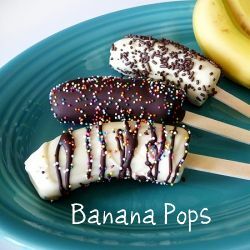 Banana pops are a healthy and frosty treat that kids can make! During the summer months this is an excellent way to use up your ripe bananas. Here are a few of our favorite frozen banana recipes. After cutting the bananas, stick each one with a popsicle stick and place them on the baking sheet that has been covered with a sheet of waxed paper. Freeze for an hour, or longer. Melt your chocolate with the butter either on medium heat using your double boiler pan, stir until melted. For microwave melting, combine chocolate chips and butter and microwave on high for 30 second intervals until melted. Take bananas out of the freezer (leave the baking sheet with waxed paper next to you) Dip each banana section into chocolate, if you are using any add ins then roll the dipped banana into them. Place back on sheet. Repeat until done. Freeze again for at least an hour. ENJOY! Peel bananas and break them into sections and add to the mixing bowl, if you are using other fruits, juice or yogurt add them now. Blend using fork or stick blender. If you are adding chocolate chips stir in once other ingredients are well blended. Spoon mixture into popsicle molds. Freeze for at least 3 hours. Enjoy! Did you like the banana pops? Try more recipes here!